Book Description"What do you do for fun? ", Johnny Carson asked Bobby Fischer when he appeared on the Tonight Show shortly after he had become world chess champion. Bobby looked at Carson as if he'd lost his marbles and replied, dead earnest, I play chess. Bobby Fischer's lone fight against the Soviet chess powerhouse made him a global hero, also for people who did not play chess at all. The Russians trembled before him, the Americans and the rest of the world cheered him on. Fischer's chess prowess and his will to win were unparalleled. But so were his eccentric behaviour and his paranoia. After he won the world title, Bobby Fischer vanished and the former prodigy became a mystery. The memories of his successwere clouded by his anti-American and anti-Semite rants. In 2008 Fischer died as an exile, on the run for the American authorities in the country where his chess career had reached its peak, Iceland. 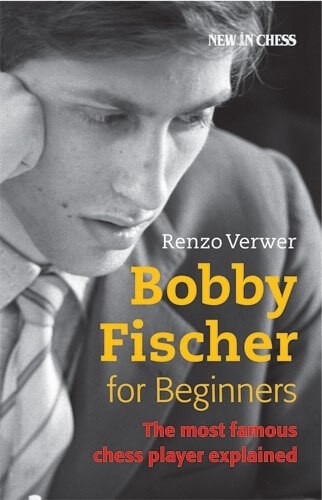 Bobby Fischer for Beginners relives the glory and the tragedy of Robert James Fischer, a troubled genius whose legacy is tremendous. A selection of Bobby's best games is included - with straightforward and easy-to-grasp notes. Renzo Verwer was born in 1972, the year The Match of the Century between Fischer and Spassky was played. He soon discovered that his own chess talent was limited, but writing about chess turned out to be a perfect substitute to channel his passion for the game.